The Ministry of Rural Development, a branch of the Government of India, is entrusted with the task of accelerating the socio-economic development of rural India. Its focus is on health, education, drinking water, housing, and roads. 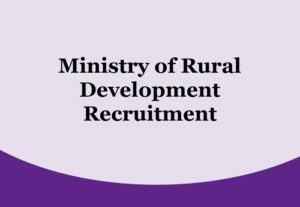 Applicants who have Completed Degree in relevant field or equivalent from a recognized Institute for Rural Development Recruitment 2019.